I’ve been looking for the perfect pair of affordable leather pants (that actually fit right) for the longest time and finally came across some at H&M the other day. I’ve always been drawn to leather pants for its simple appeal yet ability to give off an edgy vibe. You’d also be surprised at how many pieces you can pull together that go with leather pants, and how even the most basic in apparel can look trendy in appearance solely due to leather pants. Like, a basic white tee for example. 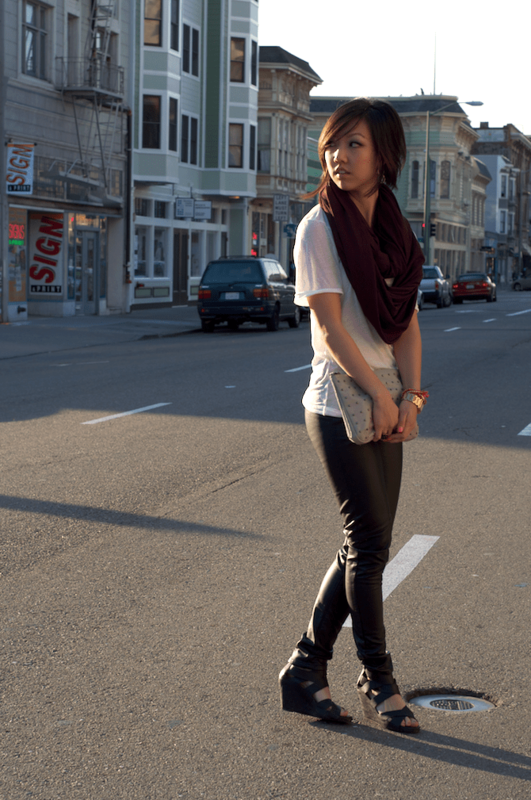 So for those looking for a fashionable alternative to denim and leggings, try on some leather pants this fall/winter! Love you hair style! Stunning outfit!! I've wanted a pair for SO LONG! I will have to check out H&M for sure! i'm in love. this look is just so simple, sleek, and chic! I love the look of the black leather and burgundy scarf!! the clutch is the perfect embellishment to the outfit! I love how simple yet chic this look is! Note to self: must find leather pants. Love the leather pants. Very sleek and chic. Cute! Love these simple outfits! i so love you!!! your hair is great and your outfit is really fab!!! you are perfect!!! love love love it!!!! kissess!!!! Hi lovely 🙂 thx for the sweet comment on my blog! You have such an awesome blog & style yourself!! I love how effortlessly cool this outfit is.! I'll be following you too! P.S. San Fran looks beautiful 🙂 I so need to visit Cali asap! hi pretty girl 🙂 thank you so much for the comment you left…i really appreciate it . i love your outfit..effortlessly chic..so stunning! great outfit. I have that clutch! Those leather pants look amazing, I've been actually looking for a great pair with a nice fit. You look great in them, following your blog. Have the same leather pants from H&M, they are addicting & comfy. Want to wear them with everything. I love your pants! I have just discovered your blog and I'm your new follower! should we follow each other?! Very simple but chic outfit! Love your hair by the way! I have yet to buy a pair of leather pants, I can't believe it, these look great on you!